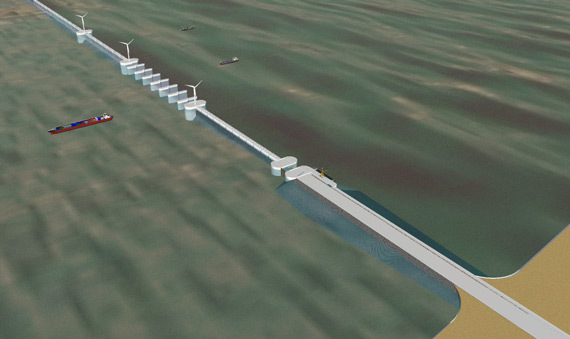 At first glance this looks like a tidal barrage, but this design does not block the water meovment as much, so it wouldn't affect the tides as severely and the environmental consequences would be much less. It could be built in sections, so power could start being generated sooner. 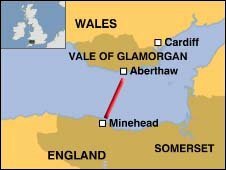 The Severn Tidal Reef project is a power generating barrage from Minehead(England) to Aberthaw(Wales). 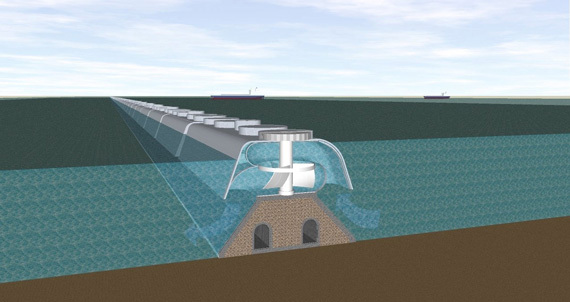 The Severn Tidal Reef Project is a totally new concept in tidal power generation with the prospect of being environmentally benign while still allowing the passage of ships and generating as much or even greater amounts of electricity than the mammoth Cardiff-Weston barrage. Unlike other monolithic tidal barrages designed to hold back the full height of the tide (the second highest in the World) the 'Reef' works with only two metres of fall (head difference) but 'slices off' the power over a much longer generation period that is much easier to match to the peaks in electricity demand. The full range of the tide is harnessed by a large number of simple low-head turbines along the twelve mile route from near Minehead in Somerset to Aberthaw in Wales . Massive yes, but more economical in materials than the Cardiff barrage or the Lagoon proposal, on account of the shape of the structure and very low pressure difference. The small difference in level between the sea and the estuary is critical when it comes to shipping, which can pass through opening sections of the Reef on their way up to Avonmouth, a port in the midst of a massive redevelopment plan to accommodate the latest generation of container ships, and where any delays can be very expensive. The small difference in level also facilitates the safe passage of salmon and other fish through the special turbines, something that is not possible with conventional turbines with their high pressure drop and sharp edged high-speed runners (rotors). Another unique feature is the 'Active Tidal Control System' that would allow the modification of the high water levels from tide to tide. A sophisticated computer system would know what high tide (even storm surge) was expected, and optimise the power extraction or free flow of water through the barrage to best meet the peaks in power demand, meet the navigation depth requirements for particular ships and protect the wildlife and habitats by obtaining the right degree of variation in water levels.